If you are looking to get into the sport of rock climbing, this course is for you! Throughout our three days together we will introduce you to rock climbing techniques, belaying, and communication. Day two will be spent discussing the more technical and finer points of the sport such as anchor construction, types of gear, how to follow a leader, rappelling and much more. By day three you will be in great shape to follow an NEM guide on a multi-pitch climb that is catered to your comfort and skill level. This course differs from the two-day accelerated program by adding the extra day to teach you the fundamentals of climbing. You will get more out of this course and it will give you a good starting point to being able to top-rope rock climb on your own. No prior experience is required. Most of the required equipment [listed below] is available for rent from our affiliate mtnGEAR. NEM climbers will receive an exclusive discount of 20% discount on all rental equipment and clothing. We climb 7 days per week in season. After three days on the rock following a leader, you will be able to understand the fundamentals of leading on trad gear. Learn how to place protection, build anchors and belay a follower, plus much more! In this course, you will mock lead on top rope. Convenient, Affordable lodging available at The Bunkhouse at Northeast Mountaineering. Spend the night for just $20 per person! For your adventure you will need one lunch and several snacks for each day. Staying hydrated and well-fed is important. Your “lunches” are taken in the field throughout the day during short 10 to 15 minute breaks. We suggest crackers, pizza, candy bars, jerky, chips, cookies, trail mix, fruits, Gu, energy bars, and hard candies. Drink mixes such as Gatorade and Kool-Aid help flavor your water. Add peanut butter, cream cheese, hard cheese, or pepperoni for additional calories and taste. If you enjoy bread items, bagels work well. Include some salty snacks to replenish lost salts. To help prevent cramping and heat related injuries, you will need at least 2 liters of water per day. Water is preferred, but other liquids such as gatorade help replace electrolytes and work well, too! When planning, don’t bring any items that require extensive preparation or cooking. We are able to provide you with boiling water on overnight adventures, but do not have the ability to actually cook food items. Our goal is to make your mountain adventure as memorable and comfortable as possible. To do this, you must be properly prepared. We provide all of the technical gear that you will need for an awesome adventure. However, we ask that you please bring your own clothing - including but not limited to: comfortable climbing pants or shorts and some insulating layers and jackets. When selecting clothing for your adventure, choose synthetic materials to wick away sweat. For your convenience, we have the mandatory gear available for rent! We also have a small selection of clothing available for rent if you are missing anything listed above. Upon completion of registration, you will receive a welcome packet via email with a gear rental form that you will complete and return to reserve the gear you need for you adventure! Please read through the following frequently asked questions and answers. These will help you prepare for your trip and get a better understanding of what to expect. Thanks! What time does the program begin? We will meet at 8AM at our bunkhouse in Bartlett, NH. We will take 30 minutes to outfit you with any rental gear you need and head out to the cliffs. What gear is needed for Rock Climbing? The mandatory items include rock shoes, harness, helmet, backpack, food, water, and proper clothing. 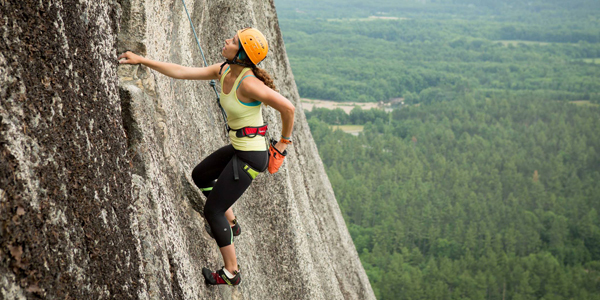 The gear rental package costs $49 and includes harness, shoes, belay device, and helmet. Unfortunately no. You will need proper rock shoes for rock climbing. How long do we climb for? We usually arrive at the cliff between 9AM and 9:30AM. We will arrive back at the bunkhouse around 3PM depending on what climb we do. Please come dressed in appropriate clothing. Layering is the best practice in the outdoors as it allows you to manage your body temperature. Be sure to have an extra warm jacket for when you are belaying. Rock climbing can be very safe when conducted properly, especially top-roping. Our guides are trained to mitigate the dangers of falling rock and other inherent hazards. How difficult is it to rock climb? The difficulty of the climb can be varied depending on your experience level and goals for the day. We offer a maximum ratio of 4 clients per guide for top-rope climbing and a maximum of 2 clients per guide for multi-pitch climbs. As long as you are approved for vigorous activity and/or you have a parent/guardian signature and you fit into the harness and mountaineering boots, you are welcome to join us! NEMs Adventure plans and itineraries are subject to change or adjustment based on a number of factors. These include, but are not limited to, route conditions, weather, terrain, and many other factors. NEM has complete discretion to change plans to accommodate any of these or other factors, including discretion to change program schedule or itinerary, and change guides or staff, as necessary for the proper and safe conduct of the program. We reserve the right to cancel any program due to inadequate signups, weather or route conditions. In such a case, an NEM credit for the full value is given; however, NEM cannot be responsible for any additional expenses incurred in preparing for the program (i.e., airline tickets, equipment purchase or rental, hotel reservations). NEM reserves the right to dismiss the Participant from a trip at any time if NEM determines, in its sole discretion, that the Participant is not physically, technically, or psychologically prepared for or capable of participating in the program. This includes being under the influence of alcohol and/or drugs. Northeast Mountaineering cannot guarantee that you will reach the summit. Weather, route conditions, your own abilities or the abilities of others may create circumstances that make an ascent unsafe, and you or your entire party will have to turn around without reaching the summit. Your program fee entitles you to one summit attempt on your specified dates. For our adventures to run as booked, we must have 50% enrollment of the maximum participant allotment. As an example, if the program has a maximum of 8 people then we must have 4 registered participants for the adventure. In the case of low registration, you may be asked to postpone or join another group on a different date. Exceptions may be made but it is at complete discretion of Northeast Mountaineering, its guides and agents. Safety is NEM’s number one priority. Our guides manage significant hazards inherent in the mountains such as avalanches, ice fall, rock fall, inclement weather, and high winds, but they cannot eliminate them. NEM guides draw from their wealth of experience and training to make sound decisions that maximize your experience without compromising the necessary margin of safety. Please clearly understand that mountaineering and all other mountain adventures are inherently hazardous sports. You are choosing to engage in an activity in which participants have been injured and killed. While those accidents are indeed infrequent, they may occur at any time and be out of our control. We ask that participants acknowledge the risk and hazards of these sports, and make their own choices about whether or not to engage in these activities. Payment in full is due at the time of booking. Cancellations outside of 7 days are fully refundable except for a $50 service fee. There will be no refunds for cancellations made less than 7 days before your program. Unfortunately, due to the time-sensitive nature of our business, and the difficulty in re-booking a trip close to departure, we cannot make exceptions to this policy. Payments may be made via MasterCard, Visa, American Express, or check. A non-refundable deposit of $200 per person secures your reservation but may vary - please check the individual pages. Payments may be made via MasterCard, Visa, American Express, or check. Final payment is due 1 month [30 days] before departure - but may vary. For your convenience, we can work out a monthly payment plan. There will be no refunds for cancellations made less than 7 days before your program. Unfortunately, due to the time-sensitive nature of our business, and the difficulty in re-booking a trip close to departure, we cannot make exceptions to this policy. All refunds will be given in NEM credit. 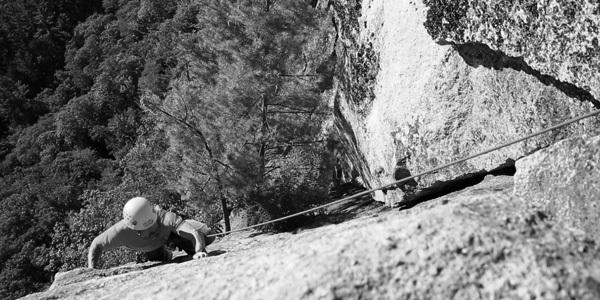 Date changes are subject to availability and apply only to the current climbing season. Date changes may be requested at anytime up to 7 days prior to your departure date for a $25 fee per person. Date changes may be requested at anytime up to 3 days prior to your departure date for a $50 fee per person. There are no date changes allowed less than 2 days before departure.